“Friendly Faces in the Garden” a high-contrast, tactile book which has been handpicked by the lovely Jenny over at Smallprint to complement the learning opportunities in this box. A natural stone pebble – a beautiful surface for little fingers to explore. A super smooth wooden pebble – compare and contrast with the other pebbles in this box or use it as a stacking toy. A gorgeously shiny mirrored pebble –watch babies’ eyes light up when they spot their reflection. A rainbow-coloured silk streamer to encourage movement and delight. 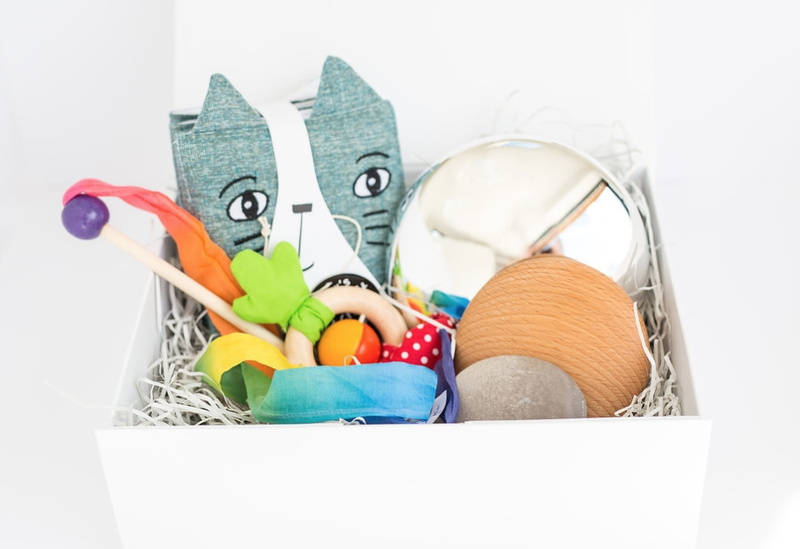 A fun Bird Rattle from Plan Toys – a bright way to stimulate your baby’s hearing with the soft bell sound. It also helps with fine motor skills and hand-eye co-ordination.